Oh the joys of computers! When it comes to my calendar I remain a “paper” girl at heart. I still look longingly at the rows of Franklin Planner cases in my office, reflections of years past. I am far more likely to remember what I write down. But I also find that if I’m too slow (as IF that happens) or I’m too busy (moi? ), paper doesn’t work. Too slow and I forget to look in my datebook. Too busy, and I need the buzzing, pop-up reminder and nagging emails that my Google calendar provides. And lately, I’m TOO busy! Having recently returned to work after a brief leave of absence, I’m still getting my groove back. One of my priorities is to carve out the ever elusive “me time” despite the resumed pressures and increased schedule-juggling. That means I’m spending more time in front my computer in search of more time to step away. I’m hooked on Google calendar these days. I think I have finally mastered the skill of having everything in one place and being able to see it wherever I go – my computer at work, my office at home, my phone. And I’ve even mastered, maybe, color-coding my appointments. Blue for Zach’s appointments. Orange for work tasks. Brown for family things. And green for my stuff. I know why they’re green – because I have to get them done, and when I make them green I pay attention to them since that is, after all, “my” color. But arguably they are just as much “me” as they are “family.” Right? Not that I begrudge in any way doing these things for my family. It’s the compact we have – I have the luxury of working part time and I do most of the household tasks. I’m good with that; really good with it. I’m just not good with defining it as “me” time. And so I made them what they rightly are: family tasks. Does it matter? No, on a practical level it doesn’t since it all falls to me anyway. But psychologically it’s huge! 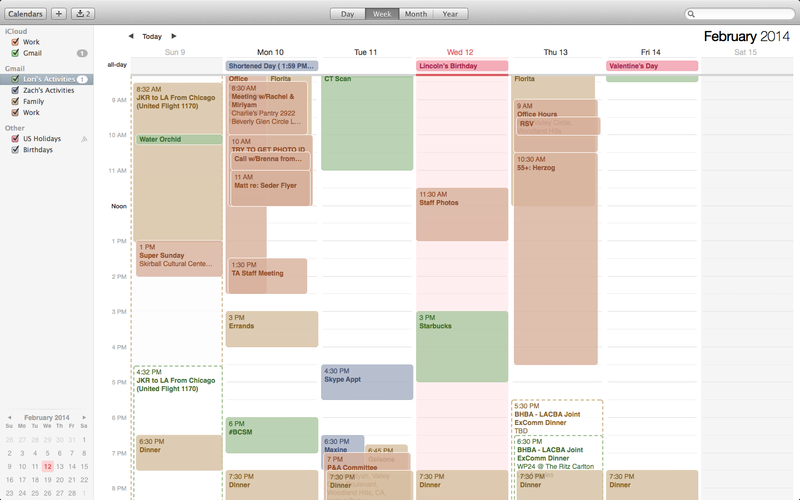 At a glance it is clear how lacking in green my newly coded calendar is. This snapshot of how I spend my time, however, has become an invitation to watch the occasional movie, make a dinner date with a friend, read a book, get to my writing, or just take a hot bath! It’s given me permission to set aside a little ME time – and I’m defining it in ways that support me! I know it’s a small victory, but we take them where we can! So tell me: How do you set aside time for you? How easy (or hard) is it for you to value that time, to use it to give back to yourself? What do you do to make sure you’re paying attention? Or do you? I still have to write things down if I am going to remember appointments. Yet the Google system looks enticing! With how busy you are I think it’s amazing that you are juggling work as well as time for the family. I love that you are giving “permission” for “me” time which you absolutely deserve lots of. We ALL deserve it! But more than that, we need it! There is so much literature on the negative impact of stress on cancer and many, many other health conditions! Knowing Google has my back alleviates some of that, and the visual of seeing whether I take care if myself alleviates more. what a revelation with the “green” spaces. it’s good that it’s reminded you of what true “me” time is. I can hardly juggle a huge paper calendar, “syncing” it with notes scrawled on paper, making sure I have reminders at both upstairs and downstairs desk/phone locations. the only good thing is I get a little more exercise on the stairs! so NOT 21st century. but my mind is in so many places at once these days, I guess I cling to the familiar. can’t deny, though, that google calendar may be in my future. sometimes it’s hard to give myself time to relax and enjoy things but I am getting better at it. I meditate every night, go for long walks with my Sadie-dog, and have returned to doing a little cooking, which I very much enjoy. it’s all baby steps, and sometimes forcing myself to return to pleasant activities – but it’s worth it. thank you for this great post! I struggle with the 21st century at times, too. By contrast I have candles and a water fountain in my writing space – I need to hold on some simplicities. But taking time for ourselves is critical. It’s the “oxygen mask first” theory… I’m so glad you’re finding time to take care of you!